Jeanne Moreau, January 23, 1928 (Paris)—July 31, 2017 (Paris). 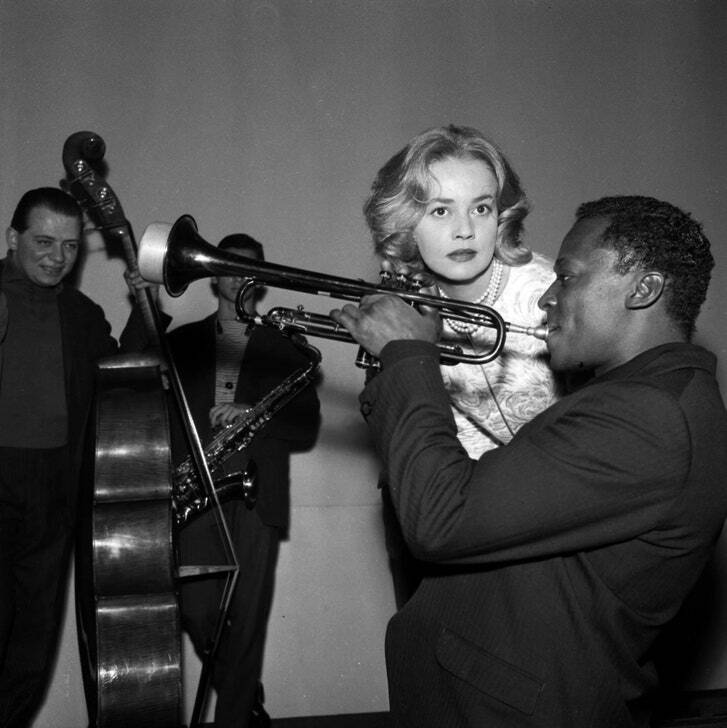 Jeanne Moreau and Miles Davis during the recording of the music for Louis Malle’s Ascenseur pour l’échafaud/Elevator to the Gallows, December, 1957. This entry was posted in FILM and tagged Ascenseur pour l'échafaud/Elevator to the Gallows, David Thomson, Jeanne Moreau, Louis Malle, Miles Davis on August 1st, 2017 by Barlo Perry. After the fall of France in 1940, Jean Renoir, Julien Duvivier, and (briefly) Jean Gabin decamped for Hollywood. Director Marcel Carné and poet–screenwriter Jacques Prévert stayed in their occupied country and, under straitened circumstances, assembled their magnum opus LES ENFANTS DU PARADIS (CHILDREN OF PARADISE). Les Enfant’s first screenings took place in Paris immediately after the Liberation, and the film was celebrated as an emblem of French fortitude and “patriotism” during wartime. Rather than talk about who did what to whom during the dark years, it was easier for Paris to find a symbol of freedom in a 3-hour “panorama of theatrical enterprise, from the lowest street performer to the loftiest actors” [Thomson], set in a simpler time one hundred years prior to its release. Friday and Saturday, February 24 and 25, at 7:30 pm. 7165 Beverly Boulevard, Los Angeles. *“Have You Seen…?”: A Personal Introduction to 1,000 Films, by David Thomson, is out in paperback. Below: Jean-Louis Barrault (standing) as Baptiste in Children of Paradise. This entry was posted in BOOKS/PERIODICALS, FILM and tagged Children of Paradise (Carné), David Thomson, Have You Seen? (Thomson), Jacques Prévert, Jean Gabin, Jean Renoir, Jean-Louis Barrault, Julien Duvivier, Les enfants du paradis (Carné), Marcel Carné, New Beverly Cinema on February 21st, 2017 by Barlo Perry.